Hamilton Dinger is not having a good summer. Since his battle with Orpheus and Starry Knight, he has felt distracted. Not with important things, or anything, really. Just work and video games and sleeping in during the summer. When Elysian forces him out of the house, Hamilton heads out for Rachel's, only to find out it is closed for her wedding. Hamilton is relieved, and then concerned, as a new demon gets ready to attack the ceremony. Can he save Rachel's big day, without letting his anger toward Starry Knight get in the way? 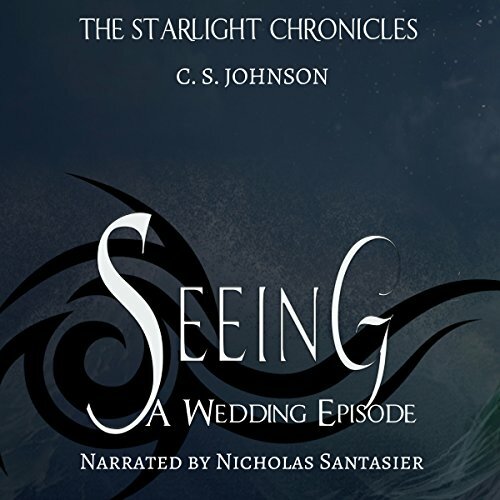 This is a short story set between Audiobook 3 and Audiobook 4 of The Starlight Chronicles, from C. S. Johnson. ANOTHER GREAT SHORT STORY !!!!! ANOTHER GREAT BRIDGE BETWEEN TWO BOOKS. IT'S EASY TO UNDERSTAND THE HERO NEEDING A BREAK AND HIS FRUSTRATION WITH A PARTNER HE CAN'T TRUST. LIFE HAS A HABIT OF SENDING TROUBLE JUST WHEN WE THINK ... AT LAST A SHORT, PEACEFUL INTERMISSION. THEN... OK WHO SAID WHAT MORE CAN HAPPEN, AGAIN. IT'S A GREAT STORY AND EASY TO FOLLOW WITH A GOOD NARRATOR. IT'S IMPORTANT TO REMEMBER THAT WHEN LIFE IS A GOOD AND OPEN ROAD. THAT FATE OFTEN WILL CHANGE THE TOPOGRAPHY AND DROP A MOUNTAIN IN THE ROAD. WHAT WILL DEFINE YOU IN THAT MOMENT IS HOW YOU FACED THE CHALLENGE. FORD THE RIVERS. BLAZE WILDFIRES. DO THIS AND KNOW VICTORY AS YOUR OWN AND A PERSONAL LEVEL OF SUCCESS !!!!! SEEIBG BENEATH ALL THE LIES! SEEING IS BELEIEVING IN THE REALM OF IMAGINATION! This is such an enjoyable short story that gives me insight I to the romantic relationships in the main books. This was a great short read and despite not being part of the main story there was still a little drama, adventure, fun, and romance.